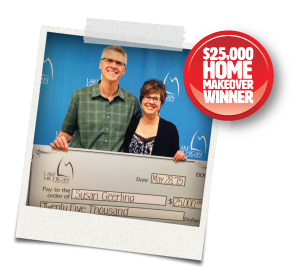 News from LMCU: Susan Geerling wins $25,000 Home Makeover Giveaway! Susan Geerling wins $25,000 Home Makeover Giveaway! We’re pleased to announce that Susan Geerling of Grand Rapids is this year’s $25,000 Home Makeover Giveaway winner! Susan arrived, with her husband, Mike, at LMCU’s Glenwood Hills corporate offices on Thursday, May 30 to receive her check. She was greeted by balloons, flowers and the cheers of LMCU staffers who gathered to help her celebrate. Turns out Susan and her husband have some definite home improvement needs that will now be possible as a result of their windfall. On tap is a new roof for their GR home, repair a gas log fireplace, and perhaps a Mackinac Island Trip. Sounds like a good strategy, Susan. Can’t argue with the results! She’ll also have an opportunity to meet LMCU spokesperson and home improvement expert, Carter Oosterhouse, to discuss design and eco-friendly building tips.